This post refers specifically to Azure Function V2. If you want to write automated tests for Azure Functions methods and want to be able to control dependencies (e.g. to inject mock versions of things) you can set up dependency injection. One way to do this is to install the AzureFunctions.Autofac NuGet package into your functions project. Once installed, this package allows you to inject dependencies into your function methods at runtime. In the preceding code, a constructor is defined that receives the name of the function that’s being injected into. Inside the constructor, types can be registered for dependency injection. In the preceding code the IInvestementAllocator interface is being mapped to the concrete class NaiveInvestementAllocator. Notice in the preceding code the [Inject] attribute is applied to the IInvestementAllocator investementAllocator parameter. This IInvestementAllocator is the same interface that was registered earlier in the DIConfig class. At runtime, when the CalculatePortfolioAllocation runs, an instance of an NaiveInvestementAllocator will be supplied to the function. The library also supports features such as named dependencies and multiple DI configurations, to read more check out GitHub. In a previous article we got an introduction to Azure Event Grid, if you’re new to Event Grid you should check it out first to familiarise yourself with some basic concepts. 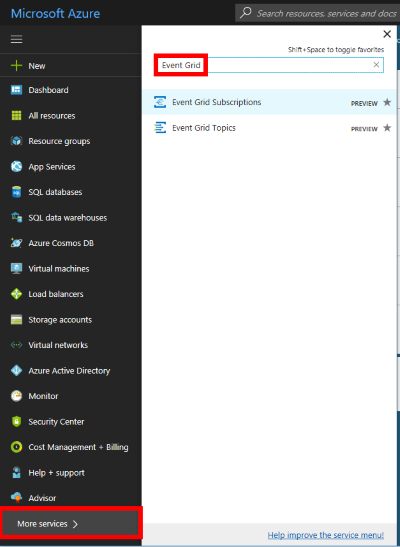 In this article we’ll create an Azure Event Grid topic and subscription and see it in action. 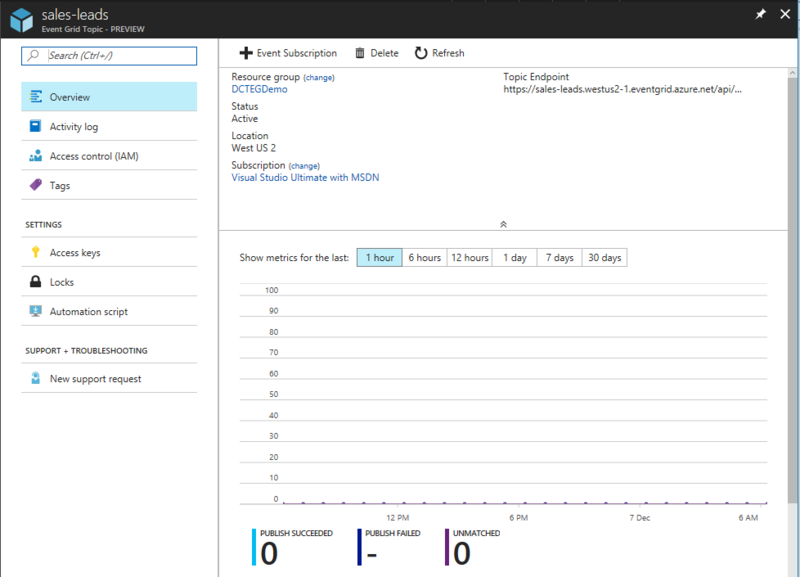 First off, if you want to create a free Azure Account you can do so, then log into the Azure portal. 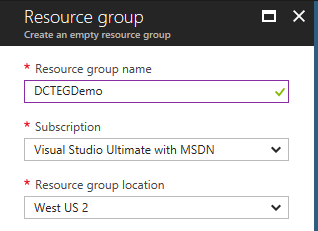 Next go and create a new resource group, Azure Event Grid is currently in preview and only available in selected locations such as West US 2. Once the resource group is created, head down to the More services option and search for Event Grid. 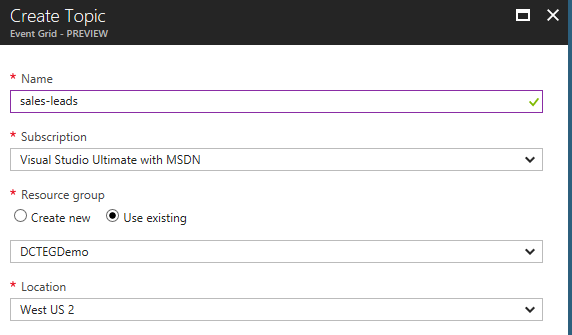 There are topics provided by Azure services (such as blob storage ) and there is also the ability to create your own custom topics for custom applications/third parties/etc. Click Event Grid Topics and this will take you to a list of all your topics. Click the +Add button to begin creation of a custom topic. Give the topic a name sales-leads and choose the resource group created earlier, once again choose West US 2. 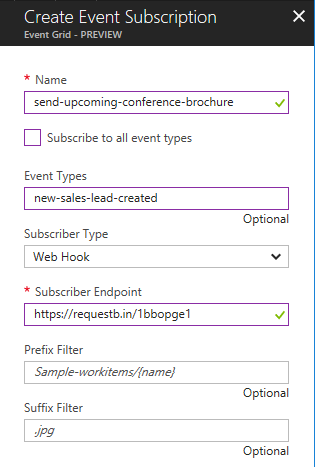 In this example we’ll create a subscription that will call an external (to Azure) service that will mail a conference brochure to all new sales leads. In this example we are simulating a temporary extension to the sales system for a limited period during the run-up to a sales conference. This is one use case for Azure Event Grid that allows extension of a core system without needing to modify it (assuming that events are being emitted). To simulate this external service we’ll use RequestBin which you can learn more about in this article. 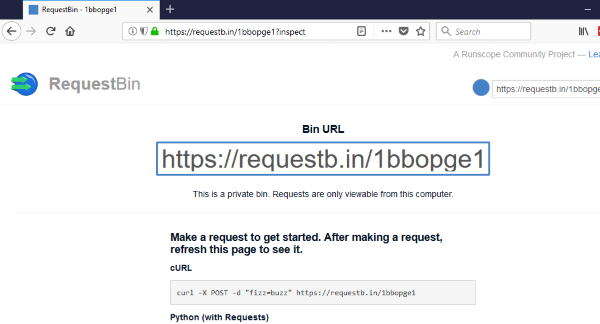 Once you’ve created your request bin, take a note of the Bin URL. 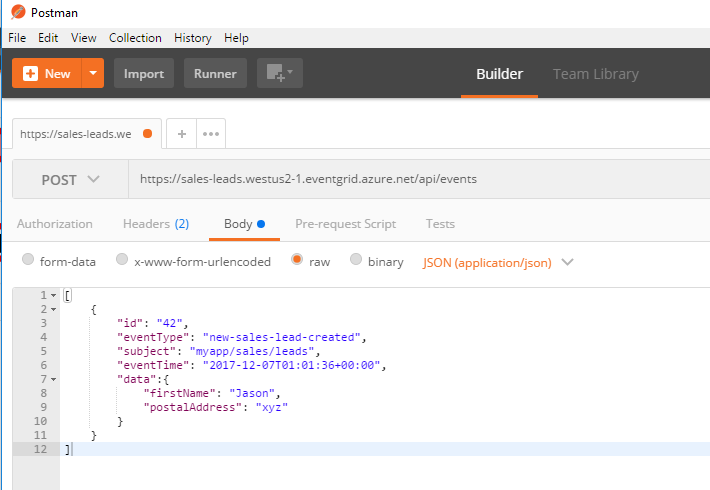 To recap, there is now a custom topic called sales-leads that we can publish events to at its URL: https://sales-leads.westus2-1.eventgrid.azure.net/api/events. There is also an event subscription set up for this topic but that is limited to only those events published of type new-sales-lead-created. 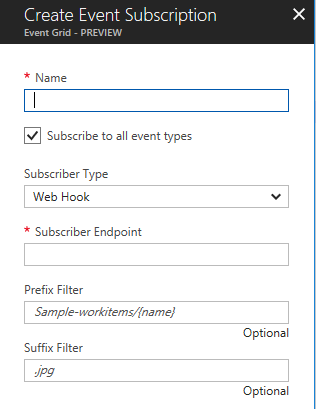 This event subscription uses the Azure Event Grid WebHooks event handler to HTTP push events to the RequestBin URL. And then click Send in Postman. You should get a 200 OK response. Because the event subscription is filtered on an event type of new-sales-lead-created, if we send a different event type from Postman (e.g. 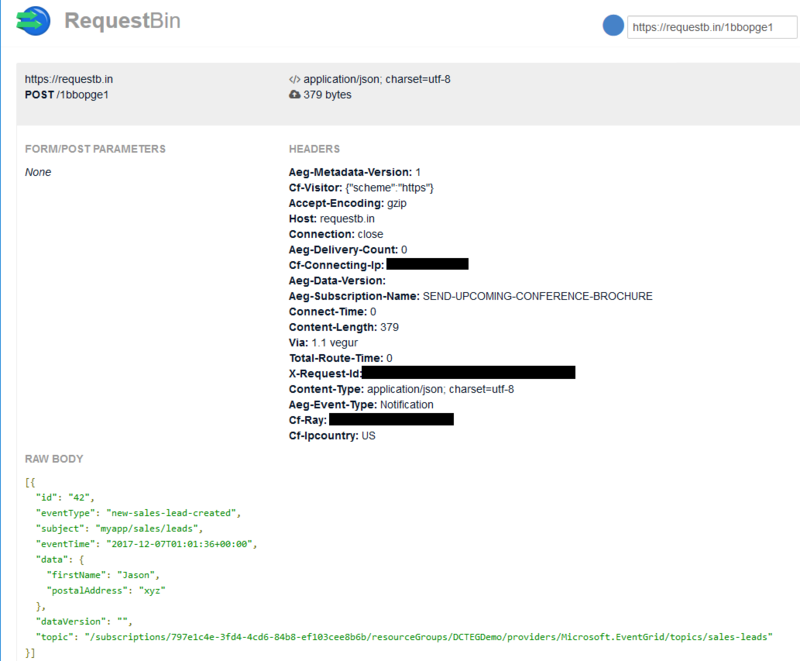 : "eventType": "new-sales-lead-rejected",), the subscription won’t activate nor push the event to RequestBin.